To get to Prescott from where we live you can take the northern route on I40 or the southern route I10. Once into Arizona on the southern route you are on back roads though and it is shorter. On the back roads you go for miles with no traffic. 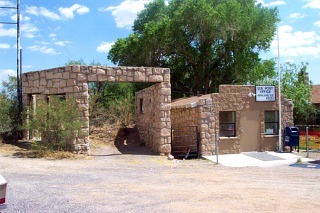 This is a picture of the Post Office (bldg on the right) in Krikland Az. I have been past here a few times and often wondered what the empty building was and I still don't know. 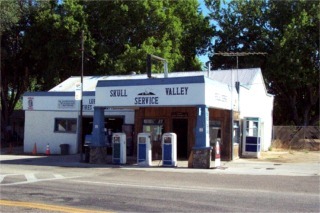 The next town along the way is Skull Valley. I have quite a few pictures of the town and inside the general store but only have room to post these few. Inside the general store they do have feed and groceries. We have also been past this place a few times and never stopped. 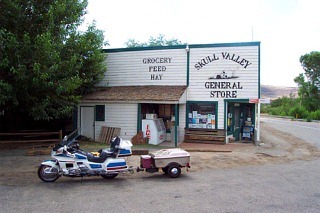 On this trip while staying in Prescott I would go out in the morning at 7 and take a 65 mile loop on some great roads for riding and go past this place so this time we stopped. It was really interesting. This is across the street from the general store. Look at the architecture of the filling station. It is very similar to many we have seen in ruins on route 66. Only this one is still in business. This is on the square in Prescott. 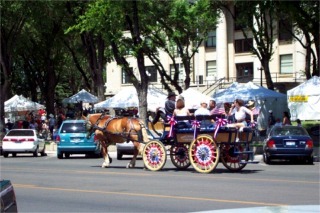 Over the 4th of July weekend they have a fair on the square. They also brag about having the Worlds Oldest Rodeo in Prescott the same weekend. You see just how bad the traffic is on what is probably their busiest weekend of the year. Watch out for those road apples folks. Reminds me of California NOT<grin>. This is the Hotel St. Michael on the square also. 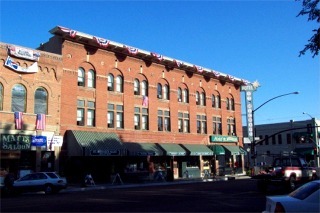 The row of buildings here is called Whiskey Row. There is a saloon here called the Palace. It is really a cool place to eat. It was first opened in 1877 and some of it's patron were Virgil and Wyatt Earp and Doc Holliday. There have been a few movies filmed here including Steve McQueen as Junior Bonner. On the way home we decided to take the northerly route and make it a 2 day ride. We left at about 4 in the afternoon and drove to Laughlin. The idea was to beat the heat as it was well into the 100's while going through the desert. On the northern route we would cross the Mojave before noon and on the southern route we would have crossed the lower desert by Palm Springs between 12 and 2. 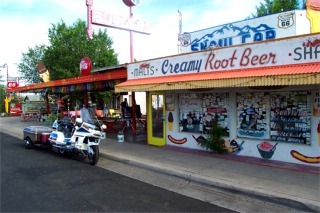 We stopped in Seligman for a break at the Snow Cap. While in line we ran into Bob Waldmire. It was his first time back to the area in 4 years. He used to run the Visitors Center in Hackberry and is a very talented artist. We talked with him for about an hour. He knows more about route 66 then anybody we know. For us this was a real treat. To route 66 fans Bob is legend with his ink drawings and maps.